The sudden death of Christopher Ewing in last week’s season finale of Dallas was an explosive turn of events, both literally and figuratively. In many ways, he was the least likely of the Ewings expected to meet death in such a manner. Intended to be the moral center of the show’s new generation, like his father Bobby had been during the show’s ’80s heyday, Christopher had the not-always enthralling duty of standing up for what’s right and good. He was at his best when he was the knight in shining armor. However, next to more colorful characters like John Ross and Nicolas, he couldn’t help but come across a bit bland. It’s not easy being Mr. Nice Guy. Then again, life for Christopher could have been worse had it not been for the fortuitous twist of Bobby intercepting Jeff Farraday’s blackmail plan against J.R. in 1981. Farraday, a Los Angeles-based drug dealer and all-around shifty guy, was Christopher’s biological father and his birth mother was Sue Ellen’s younger sister Kristin Shepard, whose resume included husband stealing, blackmail and attempted murder. Clearly, Christopher didn’t come from good stock. Luckily for him, Dallas writers seized on an opportunity to prove that nurture, not nature, determines a person’s moral compass. 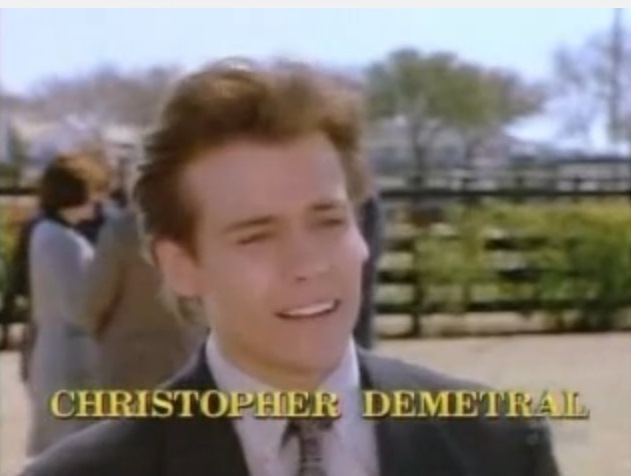 Although Chris’ beginnings were tinged with tragedy — both his birth parents met early deaths — he was destined to land safely in the loving arms of Bobby and Pam Ewing, the star-crossed Romeo and Juliet of Southfork who so craved to share their love with a child. An accident — involving J.R., of course — caused Pam to miscarry the first baby she conceived with Bobby and for a long time thereafter it was believed she could not carry a baby to full term. Bobby, thinking Christopher was J.R.’s love child by Kristin, brought him to Southfork but Pam saw him before he could confront J.R. and he didn’t have the heart to tell his jubilant wife that Christopher wasn’t meant for her. Pam eventually learned the truth, but succeeded in adopting Chris with Bobby and they hoped to raise him together. Alas, it was not meant to be. Pam (Victoria Principal) was overjoyed when she first laid eyes on Christopher. Pam barely survived a fiery car accident in 1987 and died a few years later of cancer while under the care of a doctor whom she married while Bobby and Christopher moved on with their lives back in Dallas. The aftermath of Pam’s disappearance saw a parade of women pass through Southfork seeking to make a life with Bobby. Bobby’s unexpected romance with J.R.’s reformed accomplice April Stevens (Sheree J. Wilson) was temporarily interrupted by his dalliances with lobbyist Kay Lloyd (Karen Kopins) and realtor Jean O’Brien (Margaret Michaels), a Pam lookalike. Then Christopher’s dark past reared its ugly head when Jeff Farraday’s sister Lisa Alden (Amy Stock-Poynton) arrived in Dallas and, after dating Bobby briefly, revealed her true intention to sue for custody of the little boy. Bobby fought off Lisa’s attempt to take Christopher away from him and finally married April, only to have her killed in a botched assassination plot in Paris during their honeymoon. Father and son soldiered on throughout the years while Christopher’s childhood rivalry with John Ross blossomed into full-blown war over women, Southfork and business. Christopher brought much joy to Pam and Bobby’s lives. When viewers were reunited with the Ewing boys in 2012, they were enmeshed in a complicated quadrangle involving the beautiful Elena Ramos, a childhood friend, and the mysterious Rebecca Sutter, who turned out to be Pamela Rebecca Barnes, Cliff’s daughter with former J.R. mistress Afton Cooper. Pamela’s deceit, along with John Ross’ J.R.-worthy machinations, led to the breakup of Christopher’s marriage, then his heartache reached new depths when Cliff’s vicious plot to destroy the Ewings caused the deaths of his and Pamela’s unborn twin babies. This year it looked like Chris would finally find the stability of a family life that he, like his father, craved when he met Heather, a Southfork ranch hand with a little boy. When events drew Heather and her son back to Bo, another Southfork employee who was the boy’s father, Christopher gallantly stepped aside and ended his pursuit of Heather so her little boy could be reunited with his reconciling parents. Christopher again rose to the challenge when Elena was endangered by the suave Mexican businessman Nicolas Trevino. Nicolas’ reentry into Elena’s life — they had been childhood friends in Mexico — brought much destruction to her life. Although Christopher succeeded in freeing Elena from Nicolas’ sinister influence, his victory came at a horrible price when Trevino’s hitman killed the Ewing heir in a car explosion eerily reminiscent of his mother’s infamous accident of 1987. Christopher’s departure from the Dallas saga will open powerful, new storylines for those closest to him, Bobby and Elena primarily, much like Bobby’s one-year “dream death” in 1985 led to some of the best acting by the Dallas cast left behind until Patrick Duffy returned to the show the following year. Hopefully, Christopher’s death will not be a dream and the stories lying ahead will powerfully show how the Ewings cope in the aftermath of such a cruel loss. Rest in peace, Christopher Ewing. You will be missed. Christopher provided Pam solace after her divorce from Bobby in 1983. Christopher’s hopes that his mother was alive were dashed in 2013. Elena and Christopher were as star-crossed as Pam and Bobby were in the 1980s. He died like Pam. Its sad that Digger, Rebecca, Herbert, Pam, Katherine, and even Cliff have no legacy anymore. Christopher is dead and Pamela gave the Ewings all of their combined material possessions by trusting them. The fact that Bobby and Sue Ellen fid not bat an eyelash while taking their company from her proved her mom, Afton, and her father, Cliff correct. It was very telling how Sue Ellen seemed to care and offer advice, and Bobby seemed to champion her, only for them to gloatingly take her inheritance. I bet she regrets not turning to her mother or father after the truth about John Ross’s affairs and JR and families set up of her father. Now that Christopher is dead and Cliff has been put away, and with Pamela out of the game, hopefully Katherine can make a much needed return and find a way to revive the Barnes Wentworth legacy. TNT really screwed up!! They should have not dropped the series. It was a very good program / show. It’s a shame!! These days programs that are on TV are awful!!! There is nothing to watch but sick and hateful programs. At least Dallas was a good program of today’s society. Because the programs that are on now of today’s societies are sick and etc…. whatever happened to the great shows there isn’t anymore. Someone needs to bring Dallas back. It was wide open so it can still be picked up.